To receive information about SSAA events and artists, join the email list! Street Symphony Artist Alliance is proud to announce the release of Rebekah Chesnes's debut album "Introducing"! 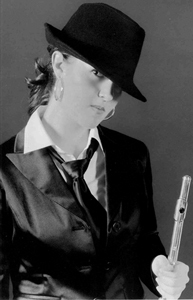 This collection of classical flute repertoire featuring Rebekah Chesnes on flute and Melody Lord on piano is now on sale at www.cdbaby.com, www.amazon.com, or the The iTunes Music Store! Pick up your copy today! For more information about Rebekah Chesnes please visit our Artists Page or www.RebekahChesnes.com. You can now become a friend of SSAA on MySpace.com! Click on the icon to view the SSAA MySpace page. Add us to your friends list, hear tracks from SSAA artists, and more! © 2007 Street Symphony Artist Alliance, LLC.